Tumor suppressor p53 plays a central role in maintaining genomic stability and tumor prevention. p53 is the most frequently-mutated gene in human tumors; over 50% of all tumors harbor mutations in the p53 gene, and over 80% of tumors have a dysfunctional p53 signaling pathway. As a transcription factor, p53 responds to a wide variety of stress signals. Once activated, p53 selectively transcribes a set of target genes to initiate various cellular responses, including cell cycle arrest, apoptosis, or senescence, to exert its function in tumor suppression. 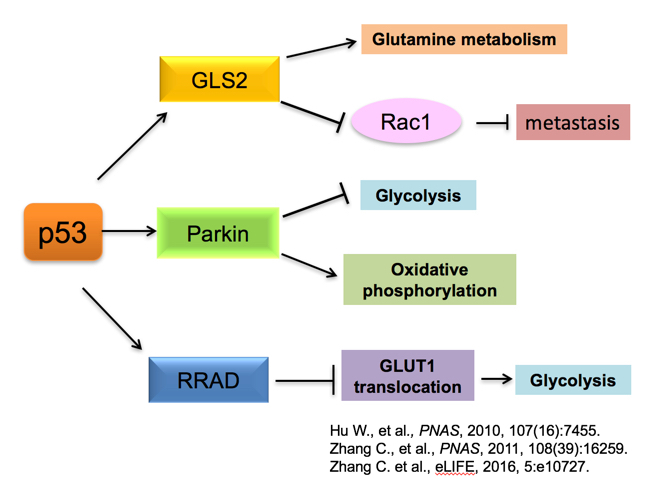 The role of p53 in regulating cellular metabolism and how this contributes to tumor suppression. 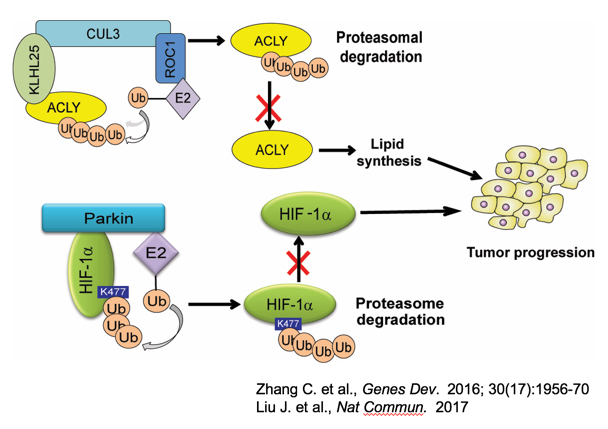 Metabolic reprogramming has been suggested to be a hallmark of tumor cells, and have been recently identified as a key contributor to malignant progression. We are interested to study how p53 maintains the hemostasis of metabolism through its regulation of glucose metabolism, lipid metabolism, mitochondrial integrity, and anti-oxidant defense, and furthermore, how these functions of p53 contribute to tumor suppression. The regulation of p53 in cells. To ensure the proper levels and functions of p53 in tumor suppression, p53 is tightly regulated by many different regulators and mechanisms in cells. 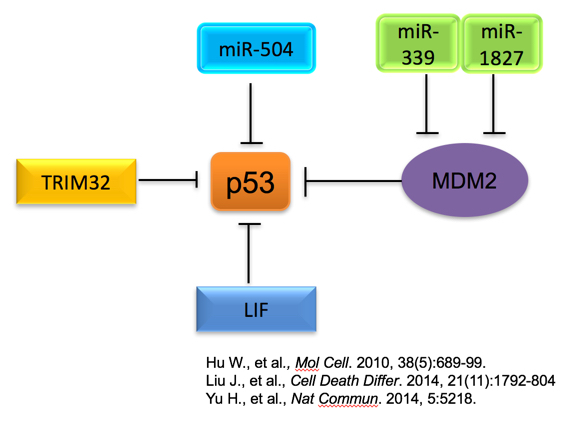 We are interested in identifying new regulators and regulation mechanisms for p53 and its signaling pathway, such as new E3 ubiquitin ligases, microRNAs and SUMOlylation modification that regulate p53 and its signaling pathway. Many tumor-associated mutant p53 proteins, particularly “tumor hotspot mutants”, not only lose tumor suppressive functions of wild-type p53, but also gain new activities in promoting tumorigenesis, which is defined as mutant p53 gain-of-function. We are interested in studying the mechanisms underlying the mutant p53 gain-of-function in tumorigenesis, and how mutant p53 can be targeted for cancer therapy. In addition to p53, we are interested to study the mechanism of metabolic reprogramming in cancer and how metabolic changes in cancer can be targeted for therapy.